I guess the run was a bit of a wild goose chase. 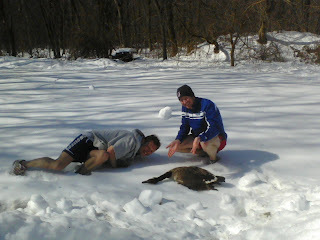 Karl and Charlie refused to believe the goose was dead. With a tear in his eye, Karl said "maybe it's just sleeping"
The rest of us shook our heads in silence. "No, Karl. I'm afraid not"
"Maybe that is ketchup in its mouth", cried Charlie. "No, no, no." we retorted. 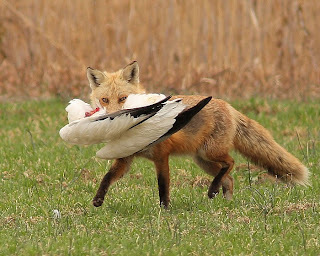 Finally someone stated, "I am sorry guys, but that goose is f%$#ing dead"
This picture has brightened my day immeasurably. Charlie's legs must be cold, nestled in the snow like dead geese.